Screen 1: Parsec 2’s newly re-organised front panel. Propellerhead recently released a major update to their Parsec synth. Here’s the lowdown on this essential Reason Rack Extension. 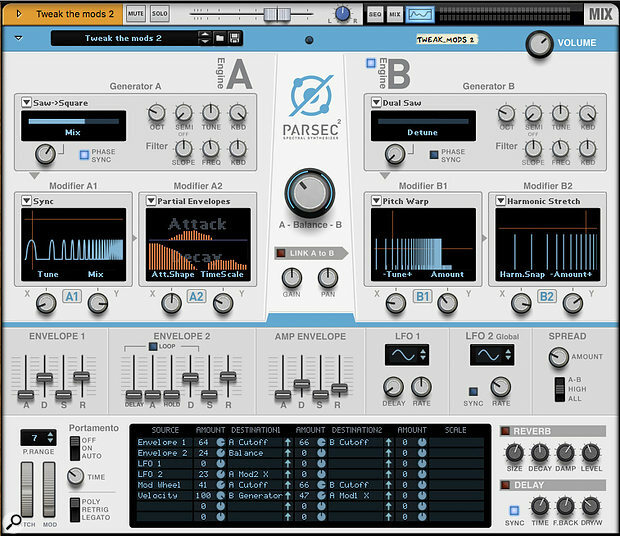 Parsec was launched back in 2013, bringing a fresh modern sound palette to the Rack which had been dominated by more traditional samplers and analogue modelling synths. It was, and still is, bang on trend with the bright, cutting sound-design capabilities of other next-gen additive synths released around that time, such as NI’s Razor and AIR’s Loom. The version 2 release is a great excuse for us to explore this brilliant synth here for the first time. For me, additive synthesis as a concept was associated with the rather academic construction of sounds from sine waves. I was disabused of this notion originally by instruments from VirSyn, such as Poseidon and Cube, which showed what fantastic sounds you could create when you have practical ways to coordinate and manipulate 512 oscillators. Additive synthesis uses the fact that all waveforms can be described (and re-synthesised) by a series of harmonic (sinusoidal) constituents. On the face of it, it might seem unnecessarily complex and processor-intensive to construct a sound from scratch using individual oscillators when a single sawtooth or noise generator gives you a wealth of them. But an additive approach gives you direct control over the spectrum of a sound from the bottom up, allowing you to do many things that would be impossible with subtractive filtering and signal processing. Given all this, Parsec’s user interface might strike you as surprisingly traditional, with sound generators that route to sound shapers, and a modulation matrix of LFOs and envelopes. This is a smart move from the designers, because if you’re familiar with Reason’s more conventional synths you should be able to get usable sounds from Parsec using a regular subtractive workflow. Some random tinkering will also lead you into less familiar, and more inspiring territory. And if you take some time to understand what Parsec is doing you can get even more stunning results, especially with some of the new version 2 modules. Parsec has two identical sound engines, laid out side by side on the panel either side of a mix control. In Parsec 1, these always operated in parallel to create tonal blends or movement. Parsec 2 adds the option to link the Modifier modules from both engines, which all then operate on a single sound generator. The layout has been shuffled around a bit in version 2 to reflect the signal flow more accurately: the sound sources are now at the top, with the Modifiers underneath (see screen 1 above). The bottom half of the panel houses the modulation source matrix (essentially the same as on Thor) and the master effects. Screen 2: The Sound Generator list now features some resynthesized sample sets and all of Thor’s wavetables.The basic workflow in Parsec is to take a sonic starting point provided by a Generator, then manipulate this sound using one or more Modifier processes. The sound source for each generator is selected from a pop-up menu (screen 2). There are familiar types like Saw/Square, Pulse, FM and Dual Saw, some that are more like wavetables, and more unusual starting points like Perc 1 and 2. Again, these may seem conventional, but bear in mind that Parsec is not actually using the traditional means to generate these sounds, these are preset patterns of many individual sine-wave generators. In any case, Parsec is more about the manipulation and modification of these sounds than trying to build sounds from the oscillators up. Parsec 2 adds two new classes of generator: everything in the list after Perc 2. All the ‘WT’ options are recreations of the wavetables from Thor’s wavetable oscillator module, and are a rich and varied source of new spectra. The four ‘Resynth’ sources are interesting, being re-synthesized from audio sample sets. These use the same sound generation technique as iZotope’s Iris, or VirSyn’s Poseidon, where recorded audio samples are analysed and then recreated with the additive synth engine. These are dynamic sources, coming from multi-sampled, multi-velocity recordings. The single knob under each generator is used to vary the sound, and it changes function depending on the source type. For example, for Pulse it’s Width, for Dual Saw it’s Detune, and for the wavetables it’s position. This can of course be modulated to provide sonic movement. There’s also a simple filter for each generator with a Slope control that varies the filter type from low pass to high shelf. Now for the fun part. The Modifiers are where you get to massage or mangle the spectra of your initial sounds. As with the Generators, the Modifiers have a pop-up menu to choose from a range of types (screen 3). Each type manipulates the array of partials in your sound in different ways, and has two user-controlled parameters assigned to X and Y knobs. In Parsec 2 the graph display in each Modifier acts as an X-Y pad controller for these parameters. Many of the first few types follow traditional filter shapes, altering the levels of the harmonics in familiar ways. When you get to things like Sync and PWM you’re seeing filter shapes that couldn’t normally be attained with traditional filter designs. The Brick BP filter is an interesting one to play with, as you sweep this you can easily hear how Parsec can sculpt a sound down to the individual harmonics. The Ensemble and Unison algorithms manipulate the spectra in completely different ways using tuning. Ensemble 1 pitch modulates each partial resulting in a chorus-type effect. Ensemble 2 does the same but you set a pitch threshold to leave the lower partials untouched. Unison generates detuned copies around each harmonic. Screen 3: New Modifier modes like Harmonic Stretch and Partial Envelopes significantly boost Parsec’s sound-design powers.There are some fantastic new Modifier types in Parsec 2 which appear below Audio In in the list. Filter Curve and Pitch Curve both allow you to draw in your own Modifier graphs. The first lets you create any filter shape you like, and the second lets you adjust the pitch of partials throughout the spectrum. By creating inharmonic series the Pitch Curve tends to make bell-like and metallic tone shifts. My particular favourite new feature is Partial Envelopes. This Modifier type gives you the chance to adjust the Attack and Decay envelope differentially across your sound’s spectrum. In the screen 1 I’ve used this on a bass sound in the A2 Modifier slot. The Decay time rolls off from the lower partials, while the attack dips up slightly. This preserves a short solid attack at the low end, but introduces a nice squelch in the mids. I’ll finish with a couple of tips. First, unexpected treats can be found by chaining multiple Modifiers. I tend to expect multi-stage processing to produce an ever-degrading mush, but the way the additive synth engine works means each stage just twists the way the sound is being generated, so it stays crisp and fresh. Combined Modifiers can do completely unexpected things. For example, try using a Modifier like Pitch Curve or Pitch Warp to create an inharmonic mess, then follow it with Harmonic Stretch with the Harmonic Snap set close to 100 percent. Chances are something new and musical will emerge. Another thing to try is the Audio In Modifier option. This will take an audio signal (connected to Parsec’s rear panel) and use its frequency character to modify the generated sound. In other words it’s a unique kind of vocoder. It can be really effective to put a drum loop, or even your entire mix, through this with a rich sustained generator source, then sweep the effect for a really unusual build-up.